For an explanation of n and numerical nomenclature (such as n-6 or 18:2), see Fatty acid § Nomenclature. For the 1920s French automobile, see Oméga-Six. Not to be confused with trans fatty acids or omega-3 fatty acid. The chemical structure of linoleic acid, a common omega-6 fatty acid found in many nuts, seeds and vegetable oils. Omega-6 fatty acids (also referred to as ω-6 fatty acids or n-6 fatty acids) are a family of polyunsaturated fatty acids that have in common a final carbon-carbon double bond in the n-6 position, that is, the sixth bond, counting from the methyl end. Members of the family can have pro-inflammatory or anti-inflammatory effects. The biological effects of the omega-6 fatty acids are largely produced during and after physical activity for the purpose of promoting growth and during the inflammatory cascade to halt cell damage and promote cell repair by their conversion to omega-6 eicosanoids that bind to diverse receptors found in every tissue of the body. Linoleic acid (18:2, n−6), the shortest-chained omega-6 fatty acid, is one of many essential fatty acids and is categorized as an essential fatty acid because the human body cannot synthesize it. Mammalian cells lack the enzyme omega-3 desaturase and therefore cannot convert omega-6 fatty acids to omega-3 fatty acids. Closely related omega-3 and omega-6 fatty acids act as competing substrates for the same enzymes. This outlines the importance of the proportion of omega-3 to omega-6 fatty acids in a diet. Omega-6 fatty acids are precursors to endocannabinoids, lipoxins, and specific eicosanoids. Medical research on humans found a correlation (though correlation does not imply causation) between the high intake of omega-6 fatty acids from vegetable oils and disease in humans. However, biochemistry research has concluded that air pollution, heavy metals, smoking, passive smoking, lipopolysaccharides, lipid peroxidation products (found mainly in vegetable oils, roasted nuts and roasted oily seeds) and other exogenous toxins initiate the inflammatory response in the cells which leads to the expression of the COX-2 enzyme and subsequently to the temporary production of inflammatory promoting prostaglandins from arachidonic acid for the purpose of alerting the immune system of the cell damage and eventually to the production of anti-inflammatory molecules (e.g. lipoxins & prostacyclin) during the resolution phase of inflammation, after the cell damage has been repaired. The conversion of cell membrane arachidonic acid (20:4n-6) to omega-6 prostaglandin and omega-6 leukotriene eicosanoids during the inflammatory cascade provides many targets for pharmaceutical drugs to impede the inflammatory process in atherosclerosis, asthma, arthritis, vascular disease, thrombosis, immune-inflammatory processes, and tumor proliferation. Competitive interactions with the omega-3 fatty acids affect the relative storage, mobilization, conversion and action of the omega-3 and omega-6 eicosanoid precursors (see Essential fatty acid interactions). Some medical research suggests that excessive levels of omega-6 fatty acids from seed oils relative to certain omega-3 fatty acids may increase the probability of a number of diseases.. However, consumption of non-rancid nuts, which are high in omega 6, is associated with a lower risk for some diseases, such as cardiovascular diseases including coronary heart disease (CHD), cancer, stroke, heart attacks, and lower rates of premature death. Modern Western diets typically have ratios of omega-6 to omega-3 in excess of 10, some as high as 30; the average ratio of omega-6 to omega-3 in the Western diet is 15–16.7. Humans are thought to have evolved with a diet of a 1-to-1 ratio of omega-6 to omega-3 and the optimal ratio is thought to be 4 or lower, although some sources suggest ratios as low as 1. A ratio of 2–3 omega-6 to omega-3 helped reduce inflammation in patients with rheumatoid arthritis. A ratio of 5 had a beneficial effect on patients with asthma but a ratio of 10 had a negative effect. A ratio of 2.5 reduced rectal cell proliferation in patients with colorectal cancer, whereas a ratio of 4 had no effect. Excess omega-6 fatty acids from vegetable oils interfere with the health benefits of omega-3 fats, in part because they compete for the same rate-limiting enzymes. A high proportion of omega-6 to omega-3 fat in the diet shifts the physiological state in the tissues toward the pathogenesis of many diseases: prothrombotic, proinflammatory and proconstrictive. Chronic excessive production of omega-6 eicosanoids is correlated with arthritis, inflammation, and cancer. Many of the medications used to treat and manage these conditions work by blocking the effects of the COX-2 enzyme. Many steps in formation and action of omega-6 prostaglandins from omega-6 arachidonic acid proceed more vigorously than the corresponding competitive steps in formation and action of omega-3 hormones from omega-3 eicosapentaenoic acid. The COX-1 and COX-2 inhibitor medications, used to treat inflammation and pain, work by preventing the COX enzymes from turning arachidonic acid into inflammatory compounds. (See Cyclooxygenase for more information.) The LOX inhibitor medications often used to treat asthma work by preventing the LOX enzyme from converting arachidonic acid into the leukotrienes. Many of the anti-mania medications used to treat bipolar disorder work by targeting the arachidonic acid cascade in the brain. A high consumption of oxidized polyunsaturated fatty acids (PUFAs), which are found in most types of vegetable oil, may increase the likelihood that postmenopausal women will develop breast cancer. Similar effect was observed on prostate cancer, but the study was performed on mice. Another "analysis suggested an inverse association between total polyunsaturated fatty acids and breast cancer risk, but individual polyunsaturated fatty acids behaved differently [from each other]. [...] a 20:2 derivative of linoleic acid [...] was inversely associated with the risk of breast cancer". Industry-sponsored studies have suggested that omega-6 fatty acids should be consumed in a 1:1 ratio to omega-3, though it has been observed that the diet of many individuals today is at a ratio of about 16:1, mainly from vegetable oils. Omega-6 and omega-3 are essential fatty acids that are metabolized by some of the same enzymes, and therefore an imbalanced ratio can affect how the other is metabolized. In a study performed by Ponnampalam, it was noticed that feeding systems had a great effect on nutrient content on the meat sold to consumers. Cynthia Doyle conducted an experiment to observe the fatty acid content of beef raised through grass feeding versus grain feeding; she concluded that grass fed animals contain an overall omega-6:omega-3 ratio that is preferred by nutritionists. In today's modern agriculture, the main focus is on production quantity, which has decreased the omega-3 content, and increased the omega-6 content, due to simple changes such as grain-feeding cattle. In grain-feeding cattle, this is a way to increase their weight and prepare them for slaughter much quicker compared to grass-feeding. This modern way of feeding animals may be one of many indications as to why the omega-6:omega-3 ratio has increased. The melting point of the fatty acids increase as the number of carbons in the chain increases. 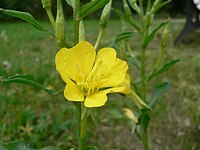 The evening primrose flower (O. biennis) produces an oil containing a high content of γ-linolenic acid, a type of omega-6 fatty acid. Four major food oils (palm, soybean, rapeseed, and sunflower) provide more than 100 million metric tons annually, providing more than 32 million metric tons of omega-6 linoleic acid and 4 million metric tons of omega-3 alpha-linolenic acid. ^ JZ, Nowak (2010). "Anti-inflammatory pro-resolving derivatives of omega-3 and omega-6 polyunsaturated fatty acids". Postepy higieny i medycyny doswiadczalnej (Online). 64: 115–32. PMID 20354260. ^ a b Bibus, Doug; Lands, Bill (April 18, 2015). "Balancing proportions of competing omega-3 and omega-6 highly unsaturated fatty acids (HUFA) in tissue lipids". Prostaglandins Leukot. Essent. Fatty Acids. 99: 19–23. doi:10.1016/j.plefa.2015.04.005. PMID 26002802. ^ Ricciotti, Emanuela; FitzGerald,, Garret A. (2011). "Prostaglandins and inflammation". American Heart Association Journal. 31 (5): 986–1000. doi:10.1161/ATVBAHA.110.207449. PMC 3081099. PMID 21508345. ^ Zhao, Yutong; Usatyuk, Peter V.; Gorshkova, Irina A.; He, Donghong; Wang, Ting; Moreno-Vinasco, Liliana; Geyh, Alison S.; Breysse, Patrick N.; et al. (2009). "Regulation of COX-2 Expression and IL-6 Release by Particulate Matter in Airway Epithelial Cells". American Journal of Respiratory Cell and Molecular Biology. 40 (1): 19–30. doi:10.1165/rcmb.2008-0105OC. PMC 5459547. PMID 18617679. ^ Calderón-Garcidueñas, Lilian; Reed, William; Maronpot, Robert; Henriquez-Roldán, Carlos; Delgado-Chavez, Ricardo; Carlos Henriquez-Roldán, Ana; Dragustinovis, Irma; Franco-Lira, Maricela; et al. (2004). "Brain Inflammation and Alzheimer's-Like Pathology in Individuals Exposed to Severe Air Pollution". Toxicologic Pathology. 32 (6): 650–58. doi:10.1080/01926230490520232. PMID 15513908. ^ Moraitis, Dimitrios; Du, Baoheng; De Lorenzo, Mariana S.; Boyle, Jay O.; Weksler, Babette B.; Cohen, Erik G.; Carew, John F.; Altorki, Nasser K.; et al. (2005). "Levels of Cyclooxygenase-2 Are Increased in the Oral Mucosa of Smokers: Evidence for the Role of Epidermal Growth Factor Receptor and Its Ligands". Cancer Research. 65 (2): 664–70. PMID 15695412. ^ Yang, Chuen-Mao; Lee, I-Ta; Lin, Chih-Chung; Yang, Ya-Lin; Luo, Shue-Fen; Kou, Yu Ru; Hsiao, Li-Der (2009). "Cigarette smoke extract induces COX-2 expression via a PKCα/c-Src/EGFR, PDGFR/PI3K/Akt/NF-κB pathway and p300 in tracheal smooth muscle cells". American Journal of Physiology. Lung Cellular and Molecular Physiology. 297 (5): L892–902. doi:10.1152/ajplung.00151.2009. PMID 19717552. ^ Martey, Christine A.; Stephen J., Pollock; Chantal K., Turner; Katherine M.A., O'Reilly; Carolyn J., Baglole; Richard P., Phipps; Patricia J., Sime (2004). "Cigarette smoke induces cyclooxygenase-2 and microsomal prostaglandin E2 synthase in human lung fibroblasts: Implications for lung inflammation and cancer". American Journal of Physiology. Lung Cellular and Molecular Physiology. 287 (5): L981–91. doi:10.1152/ajplung.00239.2003. PMID 15234907. ^ Font-Nieves, Miriam; Sans-Fons, M. Glòria; Gorina, Roser; Bonfill-Teixidor, Ester; Salas-Pérdomo, Angélica; Márquez-Kisinousky, Leonardo; Santalucia, Tomàs; M. Planas, Anna (2012). "Induction of COX-2 enzyme and down-regulation of COX-1 expression by lipopolysaccharide (LPS) control prostaglandin E2 production in astrocytes". The Journal of Biological Chemistry. 287 (9): 6454–68. doi:10.1074/jbc.M111.327874. PMC 3307308. PMID 22219191. ^ Ren, Rendong; Hashimoto, Takashi; Mizuno, Masashi; Takigawa, Hirosato; Yoshida, Masaru; Azuma, Takeshi; Kanazawa, Kazuki (2013). "A lipid peroxidation product 9-oxononanoic acid induces phospholipase A2 activity and thromboxane A2 production in human blood". Journal of Clinical Biochemistry and Nutrition. 52 (3): 228–33. doi:10.3164/jcbn.12-110. PMC 3652295. PMID 23704812. ^ Olszowski, Tomasz (2015). "The Effect of Cadmium on COX-1 and COX-2 Gene, Protein Expression, and Enzymatic Activity in THP-1 Macrophages". Biological Trace Element Research. 165 (2): 135–44. doi:10.1007/s12011-015-0234-6. PMC 4424267. PMID 25645360. ^ Sun Youn, Hyung (2011). "Mercury induces the expression of cyclooxygenase-2 and inducible nitric oxide synthase". Biomedical Laboratory Science. 29 (2): 169–74. doi:10.1177/0748233711427048. PMID 22080037. ^ Wei, Jinlong (2014). "Lead induces COX-2 expression in glial cells in a NFAT-dependent, AP-1/NFκB-independent manner". Toxicology. 325: 67–73. doi:10.1016/j.tox.2014.08.012. PMC 4238429. PMID 25193092. ^ J, He (2014). "Chronic arsenic exposure and angiogenesis in human bronchial epithelial cells via the ROS/miR-199a-5p/HIF-1α/COX-2 pathway". Environ Health Perspect. 122 (1): 255–61. doi:10.1289/ehp.1307545. PMC 3948041. PMID 24413338. ^ a b c d e f g Simopoulos, A. P. (2002). "The importance of the ratio of omega-6/omega-3 essential fatty acids". Biomedicine & Pharmacotherapy. 56 (8): 365–79. doi:10.1016/S0753-3322(02)00253-6. PMID 12442909. ^ Lands, W. E. M. (2005). "Dietary Fat and Health: The Evidence and the Politics of Prevention: Careful Use of Dietary Fats Can Improve Life and Prevent Disease". Annals of the New York Academy of Sciences. 1055: 179–92. Bibcode:2005NYASA1055..179L. doi:10.1196/annals.1323.028. PMID 16387724. ^ Hibbeln, Joseph R; Nieminen, Levi RG; Blasbalg, Tanya L; Riggs, Jessica A; Lands, William EM (2006). "Healthy intakes of n−3 and n−6 fatty acids: estimations considering worldwide diversity". The American Journal of Clinical Nutrition. 83 (6 Suppl): 1483S–93S. PMID 16841858. ^ Okuyama, H.; Ichikawa, Y.; Sun, Y.; Hamazaki, T.; Lands, W. E. M. (2006). "ω3 Fatty Acids Effectively Prevent Coronary Heart Disease and Other Late-Onset Diseases – The Excessive Linoleic Acid Syndrome". In Okuyama, H. Prevention of Coronary Heart Disease. World Review of Nutrition and Dietetics. pp. 83–103. doi:10.1159/000097809. ISBN 3-8055-8179-3. PMID 17167282. ^ a b Aune, D; Keum, N; Giovannucci, E; Fadnes, LT; Boffetta, P; Greenwood, DC; Tonstad, S; Vatten, LJ; Riboli, E; Norat, T (5 December 2016). "Nut consumption and risk of cardiovascular disease, total cancer, all-cause and cause-specific mortality: a systematic review and dose-response meta-analysis of prospective studies". BMC Medicine. 14 (1): 207. doi:10.1186/s12916-016-0730-3. PMC 5137221. PMID 27916000. ^ Bakalar, Nicholas (November 16, 2017). "Nuts May Lower Your Risk for Heart Disease". New York Times. Retrieved November 19, 2017. ^ Huang, Yunying; Zheng, Sichao; Wang, Tenghua; Yang, Xin; Luo, Qian; Li, Hangshan (2018). "Effect of oral nut supplementation on endothelium-dependent vasodilation – a meta-analysis". Vasa. 47 (3): 203–207. doi:10.1024/0301-1526/a000693. ISSN 0301-1526. ^ Simopoulos, A.P. (2003). "Importance of the Ratio of Omega-6/Omega-3 Essential Fatty Acids: Evolutionary Aspects". In Simopoulos, Artemis P.; Cleland, Leslie G. Omega-6/Omega-3 Essential Fatty Acid Ratio: The Scientific Evidence. World Review of Nutrition and Dietetics. 92. pp. 1–22. doi:10.1159/000073788. ISBN 3-8055-7640-4. PMID 14579680. ^ Smith, William L. (2008). "Nutritionally essential fatty acids and biologically indispensable cyclooxygenases". Trends in Biochemical Sciences. 33 (1): 27–37. doi:10.1016/j.tibs.2007.09.013. PMID 18155912. ^ Cleland, Leslie G.; James, Michael J.; Proudman, Susanna M. (2006). "Fish oil: what the prescriber needs to know". Arthritis Research & Therapy. 8 (1): 202. doi:10.1186/ar1876. PMC 1526555. PMID 16542466. ^ KS Broughton; Johnson, CS; Pace, BK; Liebman, M; Kleppinger, KM (1997-04-01). "Reduced asthma symptoms with n-3 fatty acid ingestion are related to 5-series leukotriene production". The American Journal of Clinical Nutrition. 65 (4): 1011–17. PMID 9094887. ^ Lee, Ho-Joo; Rao, Jagadeesh S.; Rapoport, Stanley I.; Bazinet, Richard P. (2007). "Antimanic therapies target brain arachidonic acid signaling: Lessons learned about the regulation of brain fatty acid metabolism". Prostaglandins, Leukotrienes and Essential Fatty Acids. 77 (5–6): 239–46. doi:10.1016/j.plefa.2007.10.018. PMID 18042366. ^ Yong Q. Chen, at al; Min; Wu; Wu; Perry; Cline; Thomas; Thornburg; Kulik; Smith; Edwards; d'Agostino; Zhang; Wu; Kang; Chen (2007). "Modulation of prostate cancer genetic risk by omega-3 and omega-6 fatty acids". The Journal of Clinical Investigation. 117 (7): 1866–75. doi:10.1172/JCI31494. PMC 1890998. PMID 17607361. ^ Pala, Valeria; Krogh, Vittorio; Muti, Paola; Chajès, Véronique; Riboli, Elio; Micheli, Andrea; Saadatian, Mitra; Sieri, Sabina; Berrino, Franco (2001). "Erythrocyte Membrane Fatty Acids and Subsequent Breast Cancer: A Prospective Italian Study". Journal of the National Cancer Institute. 93 (14): 1088–95. doi:10.1093/jnci/93.14.1088. PMID 11459870. ^ a b Simopoulos, A.P (28 July 2006). "Evolutionary aspects of diet, the omega-6/omega-3 ratio and genetic variation: nutritional implications for chronic diseases" (PDF). Biomedicine & Pharmacotherapy. 60 (9): 502–07. doi:10.1016/j.biopha.2006.07.080. Retrieved 8 February 2015. ^ a b Doyle, Cynthia; Abbott, Amber; Doyle, Patrick; Nader, Glenn; Larson, Stephanie (2010). "A review of fatty acid profiles and antioxidant content in grass-fed and grain-fed beef". Nutrition Journal. 9 (1): 10. doi:10.1186/1475-2891-9-10. PMC 2846864. PMID 20219103. ^ Ponnampalam, Eric; Mann, Neil; Sinclair, Andrew (2006). "Effect of feeding systems on omega-3 fatty acids, conjugated linoleic acid and trans fatty acids in Australian beef cuts: potential impact on human health" (PDF). Asia Pac J Clin Nutr. 15 (1): 21–29. PMID 16500874. Retrieved 8 February 2015. ^ Cunnane, Stephen C. (2003). "Problems with essential fatty acids: Time for a new paradigm?". Progress in Lipid Research. 42 (6): 544–68. doi:10.1016/S0163-7827(03)00038-9. PMID 14559071. ^ Gunstone, Frank (December 2007). "Market update: Palm oil". International News on Fats, Oils and Related Materials. 18 (12): 835–36. Archived from the original on 2013-04-03. ^ "Food sources of total omega 6 fatty acids". Retrieved 2011-09-04. Tokar, Steve (2005-09-02). "Omega-6 fatty acids cause prostate tumor cell growth in culture". Medical News Today. MediLexicon International. Retrieved 2008-03-23. "Brain fatty acid levels linked to depression". News-Medical.Net. AZoNetwork. 2005-05-25. Retrieved 2008-03-23. Tribole, E.F. (2006-03-27). "Excess Omega-6 Fats Thwart Health Benefits from Omega-3 Fats". British Medical Journal Rapid Responses to Hooper, et al., 2006. 332 (7544): 752. Retrieved 2008-03-23.